I love the sun. Plain and simple. I love the sun and everything it brings with it…the clothes, the warmth, the flowers, and the drinks. One of my favorite things to do on a warm Spring afternoon is hit a porch/deck/patio (whatever is closest) with a homemade cocktail. 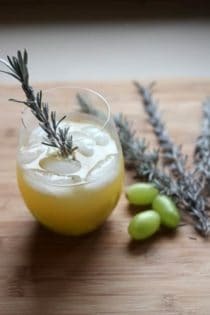 Fresh herb infused syrups are a really fun way to make unique and delicious cocktail combinations! Sangria is like the “everything-but-the-kitchen-sink” of drinks. Scour your fridge for fruits and juices. Check the liquor cabinet for liqueurs, flavored vodkas and mixes . The base of sangria is always wine, but you can use red, white, rose, or even champagne! To really make your cocktail special. Fresh herbs, herb infused syrups, and spices can be added – be creative and think of flavor combos and profiles you’ve seen elsewhere for inspiration! But, just to get you started, here are three really yummy recipes! Make the lavender syrup. Equal parts white sugar and water in a saucepan with leaves, cook on low until sugar is dissolved. Let the leaves steep in the syrup for at least 30 minutes. Strain the leaves out of the syrup using a sieve. Letting the syrup steep overnight with the leaves will result in a stronger lavender flavor but it isn't necessary. In a large pitcher combine all liquid ingredients except champagne. Add halved white grapes and cubed peaches. 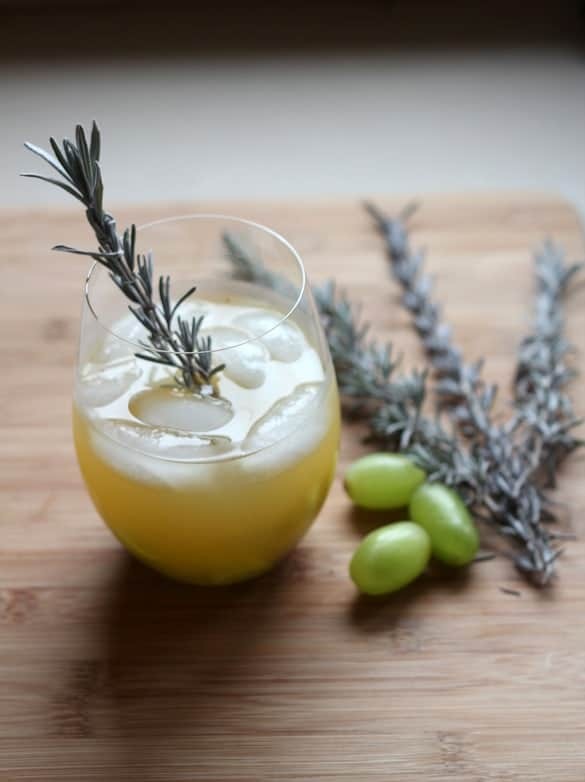 Right before you are ready to serve, add the champagne, garnish with a sprig of lavender and enjoy! -Can't find lavender? Try rosemary! -I wasn't able to find ripe peaches around here yet so I left them out. Don't worry if you can't either...try apples instead! Make cilantro syrup, directions in first recipe. In a large pitcher combine all liquid ingredients. Adjust to your liking. Too sweet? Add more lime. Too tart? Add more juice or syrup. 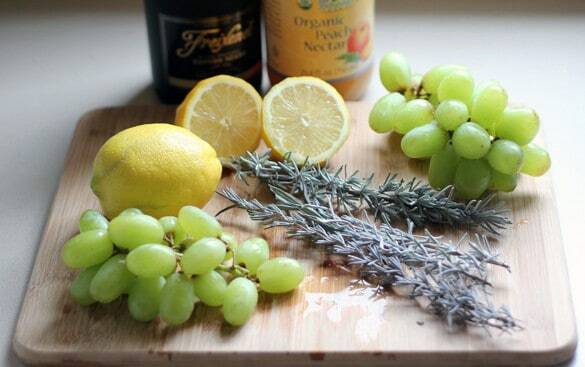 Add cubed pineapple and halved grapes. When ready to serve, garnish with fresh cilantro leaves and enjoy! -Don’t like cilantro? Use mint instead! -Don’t like tequila? Use vodka! Make basil syrup, directions in first recipe. Combine all liquid ingredients except soda in a large pitcher. Add berries of your choice, strawberries, raspberries, and blackberries would all be delicious. Refrigerate and let flavors merry…could be made the day before. When ready to serve, add the club soda, garnish with basil leaves and enjoy! Something to do with that big bottle of duty free peach vodka taking up cupboard space! I’m finding a way to include herbs in more and more cocktails, they add such a unique and often refreshing element. Lavender and lemon is a favorite…and I can’t wait to experiment with some of these! this all sounds so delicious. Thanks for posting on my linky party today. I’ve been wanting to try sangria…but never really knew anything about it. But now these recipes have so motivated me. Pinning! Fresh herbs are some of my favorite things…and this is an interesting twist! I can’t wait to make it for myself on a warm summer night. Sound amazing. So different! Peach Lavender! Ah great combo! A simply gorgeous summer cocktail! Can’t wait to make it! I LOVE sangria! These are such creative and yummy recipes! Pinning now!